Protect your car from love bugs with the Diamondite Ultimate Love Bug Defense Kit! Protect glass car windshields, auto glass, and car windows. Home > Diamondite Ultimate Love Bug Defense Kit CLOSE-OUT! Prevent Love Bugs from making a lasting impression on your vehicle! The Diamondite Ultimate Love Bug Defense Kit is tough protection against acidic bug remains and the damage they can do to your vehicle. Prevent bugs from eating through paint protection to permanently etch the paint by using stronger surface protection and by removing them before the acids can do any harm. The Diamondite Ultimate Love Bug Defense Kit is your personal defense system against bugs, especially notorious Love Bugs. In Florida, Love Bugs are a real problem for motorists. Imagine not being able to walk outside without stepping into a cloud of little, black bugs. Now try driving a car through swarms of the nuisance bugs as they congregate on warm roadways. For a brief time in the Spring and several weeks in the Fall, vehicles across Florida are speckled with Love Bugs. Love Bugs cause almost too many problems to list! First of all, their fatty tissue tends to spread across the windshield, obscuring the driver’s vision. Secondly, that same fatty tissue can pit car paint in a matter of days. Left to bake in the sun, Love Bug remains become like acid to your vehicle’s paint. 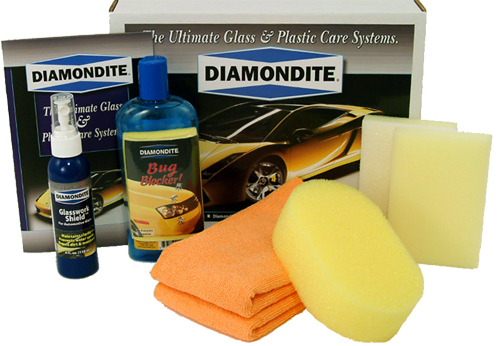 For the glass and paint, we recommend the Diamondite Ultimate Love Bug Defense Kit. The Diamondite Ultimate Love Bug Defense Kit helps two ways: First, it provides tougher surface protection formulated specifically to stand up to bugs. Second, the kit includes professional quality sponges that scrub away bug remains before they affect the vehicle. This two part defense gives your vehicle more than a fighting chance against sticky, acidic insects. Diamondite® Bug Blocker! is a 21st century polymer compounded to hinder impacted flying insects from damaging vehicle surfaces. The buffered colorless gel is easy to apply safely by hand and provides both a physical and chemical barrier to safeguard the vehicle surface. Bug Blocker! provides a polymer film which impedes direct contact of the impacted flying insect with the vehicle surface. The buffering agents in Bug Blocker! are designed to neutralize body fluids from impacted flying insects. Bug Blocker! is easily removed after use by simply rinsing the treated area with water from a garden hose. Bug Blocker! may be used on all types of vehicle surfaces as well as plastic bug shields, chrome trim and paint protection film. Protect your glass now and in the future with Diamondite Glasswork Shield. This polymer glass sealant is designed specifically to fill the microscopic ridges and valleys of glass. This perfectly clear coating repels dirt and moisture to maintain optimal visibility. This tough polymer coating makes cleaning the glass easier by repelling water, oil, and soil. Glasswork Shield provides a barrier between insects and the glass to help prevent etching. The Pinnacle Professional Bug Sponge is a dual-sided scrubber and foam sponge in one. Use the textured side to release the bugs from the surface of your vehicle. Then flip the sponge to wipe away the loose debris. The Pinnacle Professional Bug Sponge has soft, honey-comb pores that are gentle on all automotive surfaces. The Zip Sponge is made of open-cell foam. The small, rigid cells gently scrub the glass surface to remove bugs, tree sap, and contamination with the help of your regular car shampoo. When used with a lubricating wash, the Zip Sponge is completely safe on windshields and windows. To soften the foam, soak it in warm water for 3-5 minutes. With a 70/30 blend of polyester and polyamide, the Cobra Mango Breeze Microfiber Towels are designed to perform all your cleaning, polishing and buffing jobs at wallet-friendly price. These towels have a double-sided structure: one side has tight loops for cleaning and polishing, the other side is feathery soft for buffing. Use these towels to buff your windshield after applying Diamondite Glasswork Shield. Your vehicle’s best line of defense against bugs is the Diamondite Ultimate Defense Kit. Protect the leading edges from acidic bugs and potential etching with Diamondite’s advanced surface protection. Make sure the hood, mirrors, grill, and bumper are clean and dry before applying Bug Blocker. Squeeze a liberal amount of Bug Blocker! onto the included sponge. Wipe the product onto all leading edges in a side to side motion until all surfaces are covered. Bug Blocker! may be applied to warm surfaces. Rinse sponge in fresh water after use. Allow product to visibly dry before driving. For the best results, remove Bug Blocker! within 24 hours of application by rinsing the treated area with a water hose. If necessary, use the included Zip Sponge Glass Scrubber to help remove residue. Retreat as needed to block bugs from sticking to your vehicle’s leading edges. Clean and dry the glass before applying Diamondite Glasswork Shield. Mist the glass with Glasswork Shield. Use a microfiber towel to wipe the product over the glass. Flip the towel and buff until dry. Apply Glasswork Shield to all glass to protect against bugs, water spots, and films. It does not need to be removed. Reapply when water no longer beads on the glass. * When you do find bugs on your vehicle, use the Professional Bug Sponges to gently scrub away the sticky remains. Used with soapy water, these soft sponges are 100% safe on automotive paint, glass, and metal. A total retail value of $49.94. Save $19.95!